International Journal of Research in Health Sciences,2015,3,1,66-70. 1- Associate Professor, Fathima Institute of Medical Sciences, Kadapa, A.P., INDIA. 2- Assistant Professor, Fathima Institute of Medical Sciences, Kadapa, A.P., INDIA. The importance of breastfeeding in infant nutrition, health and survival has long been recognized. It is now well Established that over millennia, breast feeding has been major determinant of infant growth, health and survival, and the contraceptive effect of lactation has been the principal regulator of human fertility. 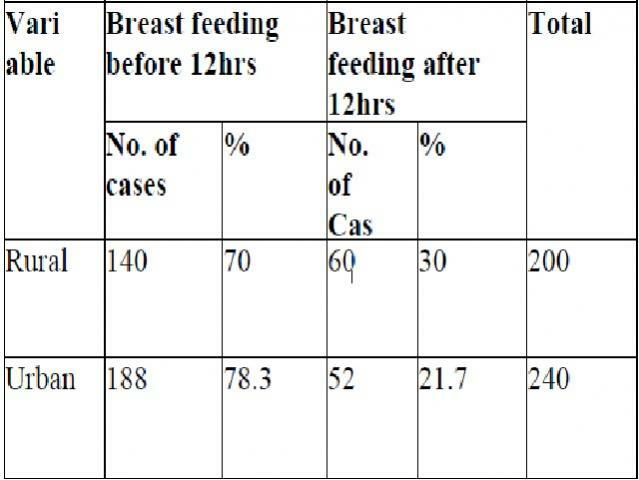 Objective: To study the breast-feeding practices among urban and rural women in and around Kakinada. The present study was done in pediatric outpatient department on the mothers with children of < 1-year age, The subjects were randomly selected who are attending the pediatrics outpatient department. The study was carried over a period of one year, (i.e., November 2004 to October 2005). The number of mothers interviewed was 440 (n=440).